Bicyclists and pedestrians will be detoured from the closed section of the trail for about a year between West Galer Street and Centennial Park. 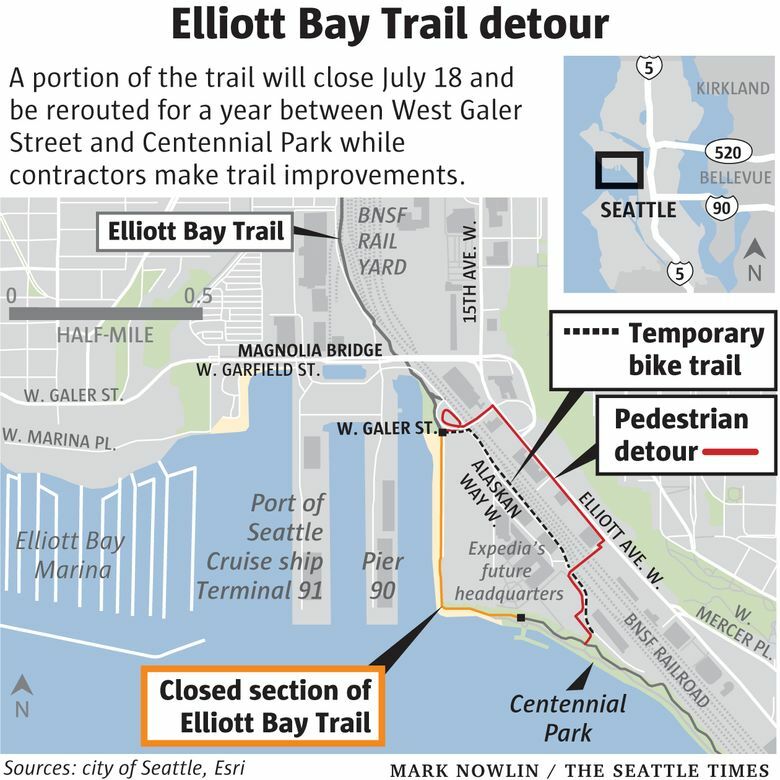 Bicyclists and pedestrians will be rerouted for more than a year along a half-mile stretch of the Elliott Bay Trail while workers make safety renovations. Access to a waterfront portion of the trail will close July 18 between West Galer Street and Centennial Park where contractors are building Expedia’s new Seattle headquarters. The work is being done as part of Expedia’s effort to ready its campus to thousands of workers. The Bellevue-based online travel company plans to move at the end of 2019 and have 4,500 employees on the site. During the detour, pedestrians will be directed toward the Helix Bridge, which is equipped with an elevator, walk along Elliott Avenue and return to the trail by the Galer Street flyover. Cyclists will be routed along Alaskan Way, connecting back to the trail at both ends of the closure. Detour signs will be posted at each end of the closure, and pavement striping and stenciling will be applied every 100 feet for bicycles and every 50 feet for pedestrians. Flagging crews will assist people during busy traffic times. GLY Construction crews will separate and widen the paths for pedestrians and bicyclists, and round out a sharp corner of the trail that creates a blind spot for some riders. In addition, builders are burying power lines along 16th Avenue that feed the Centennial Park fishing pier and adjacent public restrooms, installing utilities and constructing a public access area. The work is expected to take about a year, and the trail will reopen to the public in fall of 2019. A spokeswoman for Expedia declined to say how much the renovations will cost, but Expedia is paying for the public improvements. Cascade Bicycle Club, an advocacy group for cyclists in Seattle, is supportive of the effort. Blake Trask, senior policy director at Cascade, said he’s confident with the plan because cyclists will be rerouted along a dead-end street with limited car traffic. “It’s not ideal to close [the trail], but the payoff will be worth it there for neighbors and visitors,” said Sarah Gavin, a spokeswoman for Expedia. Seattle Times reporter David Gutman contributed to this story. Michelle Baruchman: mbaruchman@seattletimes.com or 206-652-6588.